This one is for the Zentangle purist.. Make 2 3.5 inch square zentangle for 1 partner on white card stock, heavy duty drawing paper, Bristol or other similar paper that permanent ink will perform well on. 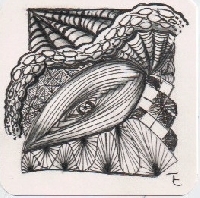 If unfamiliar with this format please visit,www.zentangle.com. You will be making 2 zentangles for 1 partner. You can try using a little shading by using a soft pencil, blending pen or pale grey marker. Shading is not required just a suggestion for this other wise traditional zentangle. Don't forget to put your information and name of swap on the back. The usual Swap-bot rules apply. Flaking will not be tolerated. If you have a problem let me and your partner know. If you are flaked on please let me know.